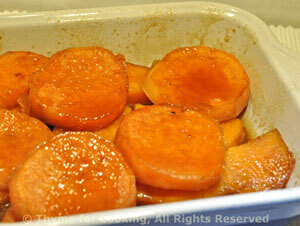 Maple Glazed Sweet Potatoes, Thyme for Cooking holiday recipes. These are not overly sweet - no mini-marshmallows. The taste of the sweet potatoes shines through and is enhanced, rather than overpowered, by the maple. Peel sweet potatoes and cut into 3/4 inch (2cm) rounds (the short way). Cook in boiling, salted water until just tender, easily pierced with a knife. While potatoes cook heat the syrup, butter and brown sugar to boiling in a small saucepan. To assemble: Lay the potatoes in a baking dish just large enough to hold them all easily. Don't fuss with the layers but do spoon a bit of syrup over each potato slice. Pour the rest of the syrup over the top and bake, uncovered, 350F (175F) for 30 minutes. Baste once after 15 minutes with the syrup from the bottom of the baking dish. Serve.